That video is our favorite 8:23 of NBA action in the last, oh, 200 years. Just savagery on a colossal scale. Maybe we’re idiots for thinking that’s the best thing to happen to the Association since Michael Jordan, but hey, we’re suckers for entertainment. And Spurs/Pistons, yeah, we’ll opt for Seinfeld re-runs, thanks. The player is Ron Artest. (Though you could substitute just about any player then on the Pacers). The scene is the Palace at Auburn Hills. The day? When the NBA had life. The word that comes to mind? That’s what the comments are for, riot fans. Pick a year. Don’t like 1991? How about ’92? Wanna keep it 21st century? OK. Then 2002. When Miami and Florida State meet on the football field, strange things seem to happen. And placekickers would be better off calling in sick. The teams are Florida State and Miami. The sport? Football, obviously. The word(s) that comes to mind? All together now in the comments. Word Association: Darius Washington Jr. This is one of our favorite moments in recent sports memory. Cruel? Slightly. 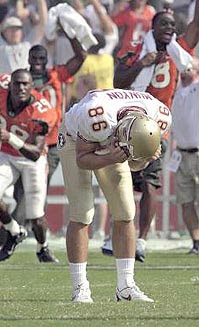 But it also conveys the emotion only found in college sports. The player is Memphis’ Darius Washington Jr. The setting is the 2005 C-USA championship game. A win would give Memphis the automatic bid to the NCAA Tourney. Lose, and the season’s over. The word that comes to mind? Let us know in the comments. Tug-job to Josh at The Beautiful Game for the idea. The video is the play now known as “The Flip,” where Captain Pussyman makes a pretty good defensive move to best the A’s in the 2001 playoffs. But that play will live in Bay Area infamy. As will Jeremy Giambi. The player is, of course, Jeremy Giambi. The word that comes to mind? Let us know in the comments.